How to use Abs Roller? Abdominal Roller Wheel is designed specifically for today’s Athletic generation. Fitness is not just a hobby. It is a way of life. These Roller Wheels have Molded plastic discs,steel rod with comfortable grips. 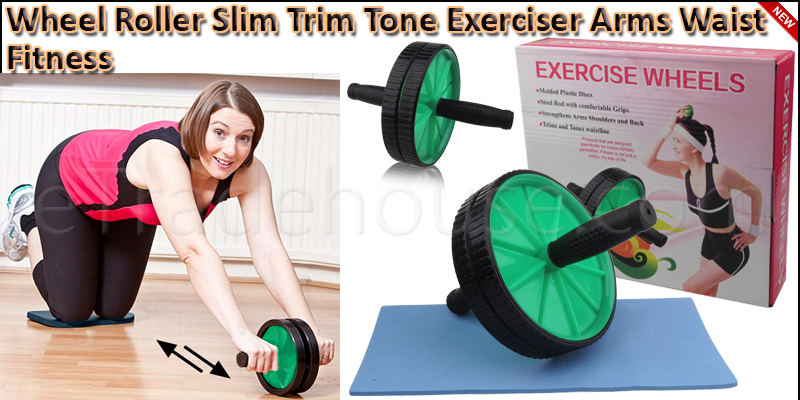 Ideal for strengthening Arms, Shoulders and Back, also trims and tones waistline. By simply rolling AB Wheel forward and backward you tone and firm your entire upper body. This Roller wheel is great to control the degree of your workout by rolling farther of closer to easily strengthen, stretch and firm. Twin Wheeled Abdominal Wheel Exerciser. Foam padded handles for easy grip during use. Comes with dual wheels for stability and non-slip handles for comfort. Start looking great, the easy way! AB Wheel is ideal for burning excess calories. This Roller is designed to work and build the abdominal muscles. Helps to tone Abs,shoulders and back of arms. The compact size allows you to store it anywhere or carry it when traveling! This Roller wheel is compact and portable, use it anywhere, anytime. Comes with a knee mat. Hold the Wheel Roller with both hands and kneel on the floor. Now place the Wheel Roller on the floor in front of you so that you are on your hands and knees (as in a kneeling push up position). This will be your starting position. Slowly roll the Wheel Roller straight forward,stretching your body into a straight position.Tip: Go down as far as you can without touching the floor with your body. Breathe in during this portion of the movement. Tip: Go slowly and keep your abs tight at all times. 3x Abs Abdominal Roller Wheel Exerciser with Knee Mat.